This great building is the last of the medieval churches in Norwich city centre to appear on this website, simply because it is the last one that I have been able to get into. Previously, I have always found it locked. It may come as a surprise to some people to discover that I get no pleasure from moaning about locked churches. Indeed, there is something both frustrating and dispiriting about finding the House of God locked to pilgrims and strangers. 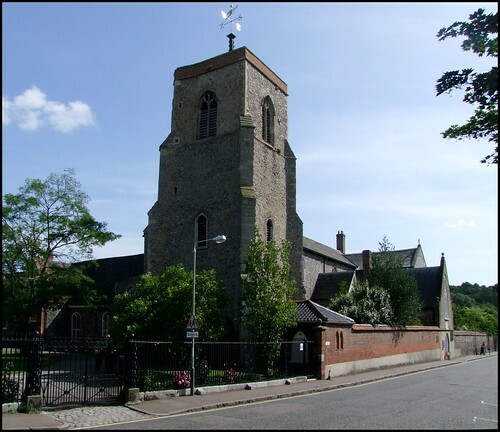 I realise that many Anglican congregations are shrinking and ageing, and some of them find it increasingly difficult to manage the buildings in their care. But I do not think that can be true of St Helen. Be that as it may, we came here on one of the open days at the Great Hospital next door. The irony is, of course, that the church is also open on these occasions, partly to allow access to Eagle Ward, of which more in a moment. But this extraordinary church is actually the far more interesting of the two, and it is a great pity that it is not easier of access. There is no other church quite like St Helen. You can see this at once from outside in Bishopgate. The great length of the church is hidden behind a high wall, with one of the two long south transepts forming a porch-like entrance. You don't need to go beyond the wall to tell that St Helen is part of a great complex of buildings which adjoin it to north, east and west. This is the Great Hospital, a community of almshouses still in use for essentially the same purpose as it has been for 750 years. Above the entrance door to the church is an 18th Century Protestant triumphalist inscription: King HENRY the Eighth of Noble Fame Bequeath'd this City this Commodious Place. With Land and Rents he did Endow the same to help decreped Age in woful Case. EDWARD the Sixth that Prince of Royal Stem Perform'd his Fathers generous Bequest. Good Queen ELIZABETH imitating them Ample Endowments added to the rest. Their pious Deeds we gratefully record While Heaven them crowns with glorious Reward. Thus, in rather long-winded form, we learn that, after the Protestant Reformation, the ownership of St Helen and the Great Hospital passed to the City of Norwich. It had been founded three hundred years before the Reformation by Bishop Suffield, who bequeathed in his will, as Sam Mortlock succinctly records, that a Master and four Chaplains should pray for his soul, and minister to indigent clergy, the aged sick and seven poor scholars. The building was essentially an infirmary with a chancel attached. The chancel was rebuilt towards the end of the 14th Century by the notorious Bishop Despencer, possibly to give thanks for his success in helping put down the Peasants' Revolt, and the body of the church itself, along with the cloisters and their adjoining buildings, was completely rebuilt about a hundred years later. Over the centuries since, the complex has grown, with some particularly fine 18th and 19th century buildings to the north and west. There is no graveyard, and the courtyards around tower and chancel are maintained as attractive gardens for the residents. You enter the building through the south nave transept, which forms a huge, light, vaulted porch, and it is with some surprise that you step into what is actually a small, square space beyond. The chancel is blocked off at the chancel arch. The aisles and the side chapel in the other transept accentuate the width of the building. The western part of the nave was blocked off beyond the third bay of the arcades at the Reformation to form an infirmary, and a small window high in the wall actually lets into the stairway which runs up the partition wall. The chancel was a huge space, the biggest chancel of any medieval church in Norwich, and in the late 16th Century it was split into two floors to form wards for the Hospital, one for men and the other for women. Something else is strikingly unusual about St Helen, and this is that it retains its 18th century liturgical integrity. Until the Oxford Movement was so spectacularly successful in reinforcing the sacramental layout of Anglican churches in the 19th Century, the main focus in any Anglican parish church, for almost three hundred years, had been the pulpit rather than the altar. At St Helen, the altar was never moved back to the middle of the east wall, and it remains in the transept chapel. Instead, the grand pulpit still dominates the eastern end of the church, making this a properly Protestant interior. The 18th Century theme continues into the transept, with a gorgeously coloured reredos backing a simple holy table. Either side are memorials to former Masters of the Hospital. However, whereas the nave is overwhelming in the whiteness of its walls and the bareness of its wood, giving the feel of a Dutch Protestant church, the transept has a most beautiful vaulted ceiling, painted blue with white and gold ribbing. The bosses on the ribbing are vividly repainted, and are one of the most important sets in England. They are obviously in the same series as those in the Cathedral next door, with a more idiosyncratic, even folkish quality than those found more commonly in East Anglian parish churches - for example Wymondham Abbey, Walpole St Peter and Lowestoft St Margaret, where they are more formulaic. Probably, they are by the same artist as those in the Cathedral nave. They are arranged in the shape of a star lattice, with th most important boss at the centre. This is the Coronation of the Blessed Virgin as the Queen of Heaven, the most significant event in the unfolding revelation of Grace in the medieval imagination. Arranged to north, south, east and west are four significant events in the Christ story - the Annunciation, the Nativity, the Resurrection and the Ascension. The Annunciation is exquisite, with St Gabriel's Ave Maria exultation curling on a banner around the lily stem. The Nativity boss appears unusual at first sight, the naked Christ standing on a table with a blanket held behind him, and you might even take it to be the Circumcision if it were not for the cattle and angels peering over the wooden stable roof above. In fact, this is the only Nativity boss in England in this form, and the only one to depict a midwife. The Resurrection and Ascension scenes are more typical. The other bosses depict Saints and sacred monograms. The transept also contains the family pew of William Ivory, and both aisles contain lovely box pews which face across the church. I'm not convinced that the range of benches in the middle of the nave came from this church originally, although there is a suggestion that the brief inscription beneath the bench end of St Margaret refers to an early 16th Century Master of the Hosptial. I can't help wondering if there were once box pews in the middle as well, without a central gangway. If you leave the church by the north door, you enter an exquisite set of cloisters, like those of the cathedral but in miniature. A path leads through to the former priest door on the north side of the chancel, and this in turn leads into a stairway. There is still an institutional smell of disinfectant, and the wooden stairs have been worn away by generations of hobnailed boots. The lower floor is now used for storage space, but you can go up the staircase into Eagle Ward, which has been perfectly preserved as it was when it finally closed - astonishingly, this is was as late as the 1970s. The Ward stretches the full length of the former chancel. The great east window was blocked in the 16th Century, and at the west end you can see the other side of the blocked chancel arch; but because we are in the upper part of the divided chancel, the tops of vast 14th century windows flank both north and south walls, providing a surreal backdrop to the poignant little cubicles with their beds and dressing tables, still furnished with ornaments, books and magazines. At either end of the ward were the snugs, where residents could come together, and there are dining tables the length of the central walkway. A fascinating survival.